Many illnesses animals have are contagious to other animals. The infectious particles can be airborne or transferred on hands, shoes or shared items. Cats can have upper respiratory infections, dogs can have kennel cough or parvovirus. Ideally, most of these animals should be kept away from other animals (especially from patients that are in for surgery or other problems and are already in a debilitated state). The problem is that most of the contagious patients are critically ill themselves and also require constant monitoring. 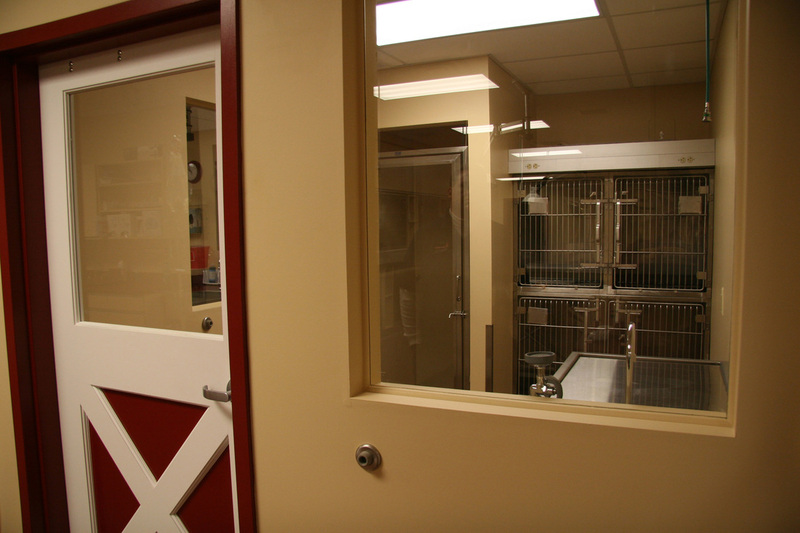 We positioned our isolation ward off of the treatment area. It is completely self-contained so that all medical items such as thermometers and stethoscopes, bowls, blankets, and mops are readily available in the isolation ward and not used on other patients. With its own sink, garbage, and shoe bath, the risk contamination of the rest of the hospital by staff members is greatly reduced.